It was her 80th birthday and as Sue's family gathered around in celebration, she announced a major decision. After years of toying with the idea, she had come to the conclusion that now - yes, now - was the proper time for her to move into a continuing care retirement community (CCRC). Although they were a bit surprised, Sue's two adult children (both seniors themselves) nodded to each other and expressed relief that their mother would have access to the support and care she needed. Both admitted to a bit of worry about her living alone since their dad died, especially as they both traveled extensively and were not available to see her or care for her on a regular basis. But, of course, they all realized that such a move would require a massive commitment of time and energy, with the first necessary step being to find a good real estate agent to help sell the longtime family home. Sue mentioned that she was acquainted with an agent she had met at church and who regularly sent her mailings. The agent seemed quite nice and professional, had won numerous awards, was active in the community, and owned a variety of impressive-looking credentials. You know, she had a whole bunch of letters and acronyms at the end of her name. Sue and her children arranged for a meeting with the agent, and while she was clearly competent and well-educated in her field, Sue just couldn't get past a nagging feeling that something was amiss. The agent was nice enough, but throughout Sue's entire life, she had tended to gravitate toward doing business only with those to whom she felt some sort of connection. Perhaps it was something she had learned from her father, a man who valued relationships in business dealings as much or more than mere competence. Not only did she want help, but she also wanted to feel a special sort of bond and trust. The practice had served her well throughout life and now - with such an important transaction - she wasn't about to change her approach. Sue scanned the yellow pages, spoke on the phone with a few agents, and even met with another over coffee, but still she couldn't find the sensation of trust and comfort she desired. She even did a couple of quick internet searches leaving her feeling confused and frustrated. It occurred to Sue's daughter that perhaps the CCRC that was to be Sue's new home would be able to provide a recommendation for a good agent. Indeed, they did, and that's when she met Joe. He arrived at her home and immediately the two hit it off. Sue hired Joe to list and sell her house and as he began to take his leave, Sue touched him gently on the arm and said "Thank you, Joe. You are different than other agents I've met with," she smiled. "I don't know exactly what it is, but I feel I can truly trust you to help me make this move." Sue's home sold quickly, and with Joe's help, she arranged for an estate liquidator to sell the belongings she no longer needed. He also arranged for a moving company to pack and transport what was needed to Sue's new apartment at the retirement community, and made sure she was content in her new home. A few days later, Sue's children visited their mother, breathed a sigh of relief that everything seemed under control, that a large project was complete and that - most importantly - Mom was happy, healthy, and safe. 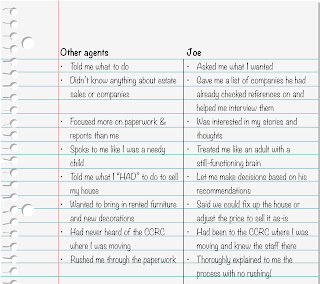 Her daughter (who admittedly had been a bit annoyed at Sue's "pickiness" in choosing an agent) smiled and remarked that Sue had made a fine decision in choosing Joe to spearhead the sale and move. "But Mom," Sue's son asked. "How did you make your decision? Why did you choose him?" 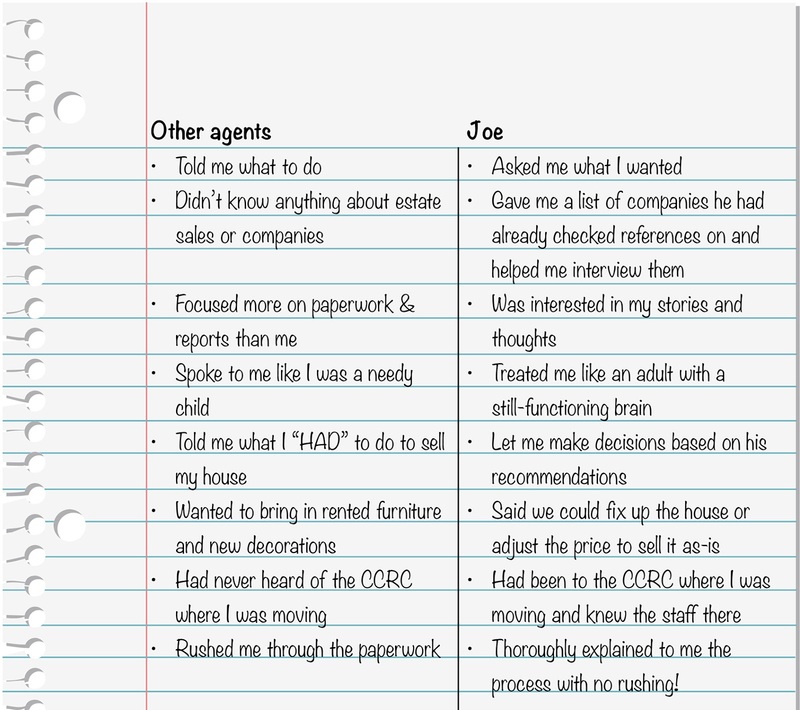 As her daughters looked at the list, Sue remarked "I felt 'OK' with the other agents. They were undoubtedly good at their jobs. But I wanted someone who was good for ME too." And thus ends the happy story of Sue, a senior whose outlook on doing business mirrors that of most of her generation, nearly all of whom value a firm handshake and "good vibes" as much as they do hard numbers and competency. 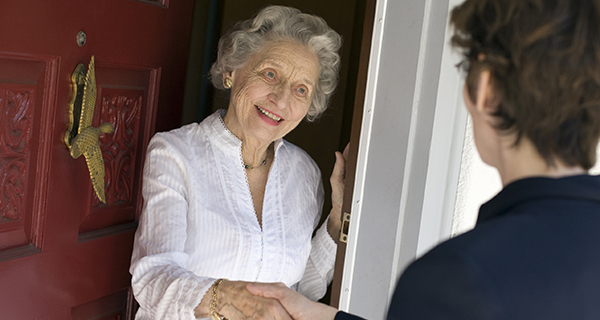 As real estate professionals serving seniors, it's important that we understand that what makes for a great partnership, truly is in the eyes of our clients.